Scleranthus biflorus growing at Plants of Tasmania Nursery. 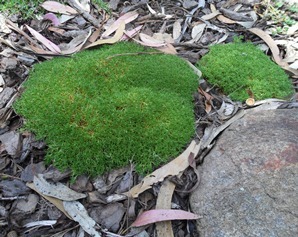 Scleranthus biflorus is a low-growing groundcover that often forms a dense cushion of green up to 50 cm across. Unlike the alpine cushion bushes, it is quite hardy and needs little if any additional water in most situations. It has tiny, paired yellow-cream flowers in spring that are best seen with a magnifying glass. Scleranthus biflorus is suited both to formal and informal plantings. For example, it makes a wonderful edging to paths and garden beds, but can also be used in rockeries and scattered amongst open plantings of shrubs. The cushions flow beautifully over rocks and logs, and can be used as moss substitutes in Japanese style gardens. It is happiest in a sunny position. A little bit of extra water will keep the plant healthy and green if it is browning off. We sell Scleranthus biflorus in 75 mm tubes for $4.95, and larger plants in 140 mm pots for $9.95. Plants in 200 mm pots are available at times, and are $20.00. There is a number of plants in our display garden - if you can't find them, ask a staff member. Scleranthus biflorus is a member of the Caryophyllaceae family. Related plants include carnations and campions, as well as one of the world's most southerly flowering plants, Colobanthus. 'Scleranthus' literally means hard flower, and members of the genus are commonly called 'Knawels'. The 'biflorus' refers to the paired flowers, also reflected in the common name. There are four other species of Scleranthus in Tasmania, three native and one introduced. At present we grow none of these species in the nursery. Scleranthus biflorus is widespread across the midlands and the east of Tasmania, growing from sea-level up into the western tiers and central highlands. It can grow in very dry as well as moister areas. It also occurs naturally in Victoria, NSW, ACT, Queensland and New Zealand. One of the most spectacular places to see Scleranthus biflorus is in the wallaby-grazed grasslands on the north-eastern side of Maria Island. The plant grows here as low mounds that the wallabies can't get at. The view over the cliffs and up to Bishop and Clerk is spectacular. There are also plants at the corner of the Tasman Highway and Grange Rd, just north of Swansea. Look on the northern side of Grange Rd near the gate. 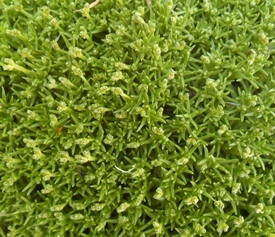 Left: Close-up of Scleranthus biflorus, showing the flowers. 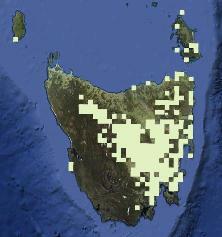 Right: Distribution of Scleranthus biflorus in Tasmania.